Popsicles, paletas, and ice pops—oh my! Summer has just begun and not only did I share 12 popsicle recipes to help you stay cool in the most delicious of ways on Monday, I'm back today with a new recipe to share in honor of Wit & Vinegar's Popsicle Week! This one is for all of my fellow coffee lovers. I don't know about you, but when the weather heats up, I tend to choose iced coffee and frozen slushy coffee drinks over a hot cuppa most days (unless I wake up particularly early and heat up the water for the French Press before the flames make a difference). 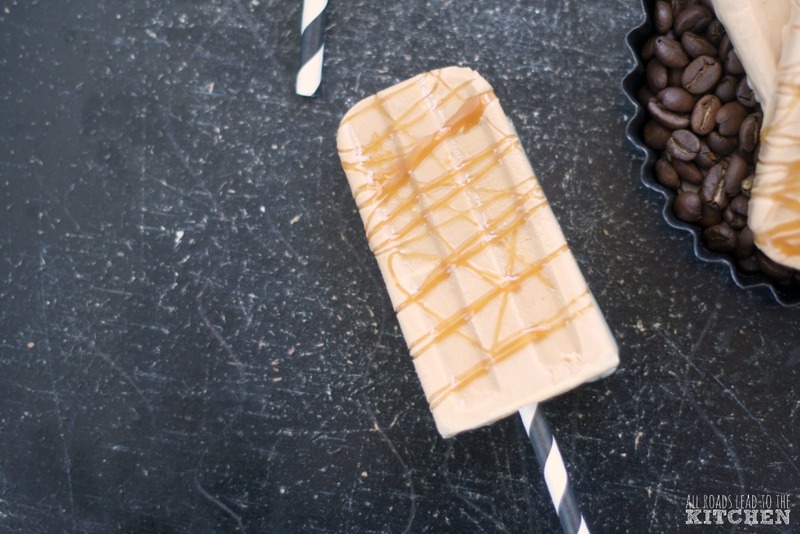 So, along those same lines of thinking, I thought it would be fun to turn a coffee drink into my favorite summer treat on a stick! Sadly, it's not a looker, but once you've tried it, you'll forget all about its plain-Jane appearance. 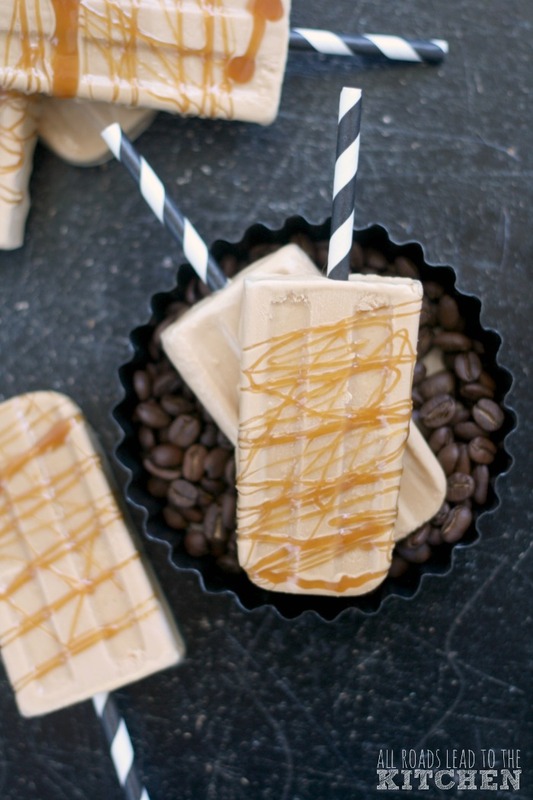 Creamy, cold, and sweet with a punch of caramel-accentuated coffee—tell me you can resist. Oh, and just for fun, I decided to set one of these popsicles into a coffee mug and pour fresh hot coffee over the top. 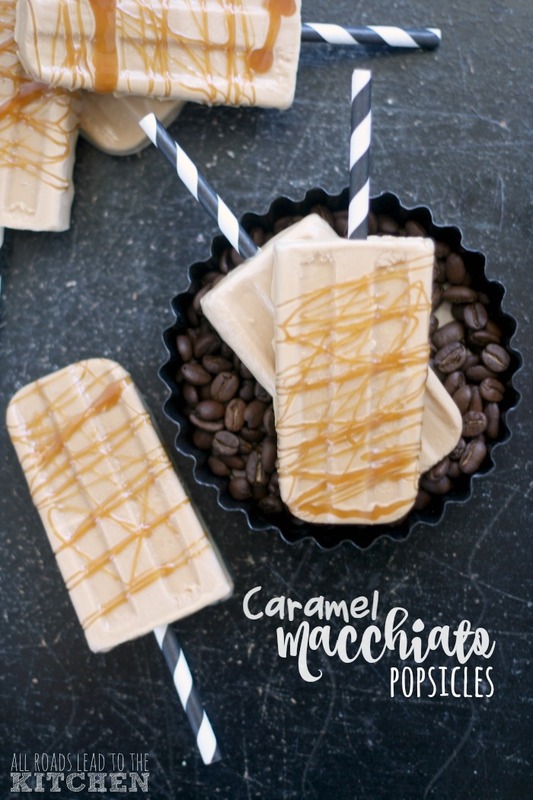 It melted into creamy flavor and made the coffee the perfect temperature for enjoying immediately (so don't forget to try that if...when...you make a batch of these)! 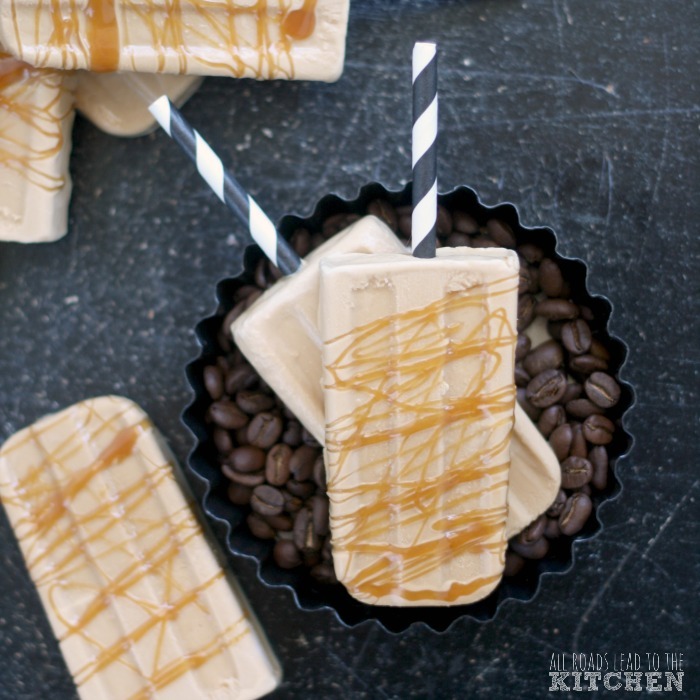 Enjoy your favorite coffee drink on a stick with these creamy frozen caramel macchiato popsicles. Combine all of the ingredients in the jar of a blender, cover, and blend until smooth and well-combined. Pour the mixture evenly into your popsicle molds and freeze until solid, about 4 to 6 hours, taking care to add your popsicle sticks at the correct time (some molds add them immediately, but I like to put a sheet of plastic wrap tight on top and freeze for a couple of hours before cutting a slit in the plastic and sliding in the sticks...this helps keep them upright and centered). After the popsicles are completely frozen, you can dip or drizzle a little bit of caramel on the top of each one and let it drip down a bit. Set on a parchment-lined baking sheet and freeze for a few minutes, until the caramel is set.